A Life Bound By Books: Haunted Halloween: Wayne Josephson + A Giveaway! The town I grew up in had a huge, old Victorian house--dark, rundown, and creepy. No one would live there because everyone said it was haunted. Many years earlier, the old woman who owned the house was found dead inside. She had no relatives or friends, and had apparently fallen down the stairs. She lay there for several days until the mailman noticed that her mail was not being picked up. He called the police, they went inside, and found her. Her face was twisted in an expression of terrible pain. After that, people in the neighborhood began hearing noises coming from the house late at night. It sounded like an old woman crying and groaning in pain. But everyone knew the house was empty, so the rumors started that it was haunted by her ghost. One Halloween during my junior year in high school, three of my classmates named Lisa, Heather, and Anne, decided to find out once and for all if the house was really haunted. All of their friends, including me, warned them not to go, but they were brave and determined. They thought it would be a thrilling adventure. It turned out to be the scariest night of their lives. At midnight, the three girls climbed the long, winding driveway up to the house. It was pitch black. The moon was covered with clouds, and they only brought a small flashlight. Heather found an open window, and they climbed inside. It was dusty and dirty, and smelled like death. “I don’t think this is such a good idea,” said Lisa. They found their way to the stairs and began climbing them. Their little flashlight cast scary shadows all around. “Isn’t this where the old lady fell?” asked Lisa, really worried now. Heather didn’t answer her. She was feeling a bit nervous herself. They reached the top of the stairs and went into the master bedroom. The boards creaked as they entered. The room had been untouched since the old lady had died. The girls sat down on the floor in a circle, with the flashlight in the middle, and waited for a few minutes. Nothing. They waited some more. Lisa tossed the coin into the air, and after a few seconds it hit the floor in front of her. Anne threw the penny up, closed her eyes, and made her wish before the coin landed on the floor. “Don’t even ask me, ‘cause I’m not telling,” she said. Just then the flashlight died. “But it’s pitch black! I’m scared!” said Anne. “I’ll get us out of here. But first I want my wish,” said Heather. Heather threw the penny into the air and made her wish. But after a few seconds, there was no sound of the coin hitting the floor. Just then, then girls heard a moaning sound echoing through the house. “She took the penny!” screamed Lisa. They shrieked with terror, jumped up, and bolted out of the bedroom, falling over each other in the dark, trying to escape. The girls scrambled for the stairs and managed to climb down the steps without falling on top of each other. Then they dashed out the front door and down the driveway. They spent the night at Heather’s house, sobbing with fear, and grateful they had escaped alive. The next day, everyone at school heard about what happened. The three girls became instant urban legends. But, after several days, Heather, Lisa, and Anne still couldn’t shake off the scare they had gotten. They had to confront their fears and try to find out the truth about that night. So, about two weeks later, they went back to the house. But this time, it was during the day—a sunny afternoon after school. Summoning up their courage, they climbed the driveway and entered the house through the same open window. They climbed the stairs one by one, holding each other’s hand. The girls entered the bedroom and looked around. Chills ran up their spines as they remembered that night. They expected the ghost to scream at them at any moment. Heather and Anne jumped, and turned around to where Lisa was pointing. They stared in disbelief. Then they all breathed sighs of relief and hugged each other. In the corner, the penny was suspended in a large cobweb. Synopsis: What better place than pale England to hide a secret society of gentlemen vampires? Screenwriter Wayne Josephson Gives Jane Austen’s Emma Some Bite. Literally. Additional information: From Bela Lugosi’s portrayal of the Count in the 1931 film Dracula, to the hit 90s TV show Buffy The Vampire Slayer, to the modern-day HBO series True Blood and the blockbuster book and film franchise Twilight, the vampire has evolved from a being that wreaks horror on humans to one that wreaks havoc on the affairs of the heart. The Regency-era comedy of manners finds Jane Austen’s beloved title character, Emma Woodhouse, attempting to arrange the affairs of the young ladies and gentleman vampires, including Mr. Knightley, in her social circle with delightfully disastrous results. 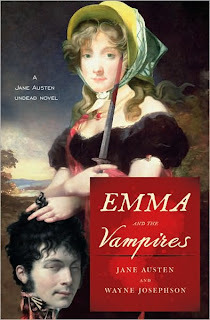 Emma and the Vampires reflects the author’s passion for retelling the great classics of literature for a modern-day audience. Josephson originally rewrote Emma for his teenage daughter, who then suggested he add vampires given their popularity in books, TV, and film. Emma is the most popular Jane Austen novel with young adult readers, and continues to delight audiences today, including the loose adaptation of the story in 1995’s Clueless, starring Alicia Silverstone, and the 1996 film adaptation with Gwyneth Paltrow portraying Emma. Is the mashup dead? No, it’s undead. 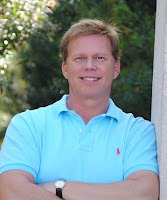 Wayne Josephson received his BA from Emory University and his MBA from Wharton. After twenty years on Wall Street, he decided to pursue his long-delayed desire to write, becoming a successful screenwriter. Josephson is also the author behind four Readable Classics books, available on Amazon and bn.com. A Huge thank you to both Wayne and Scoucebooks - Wayne for the story and Scourcebooks for the donation which made this giveaway possible! You MUST complete the form to enter. No entries in comments please they won't count. Comments are welcome, so share your love with Wayne! This contest is open to to US residents only. Sorry! Good luck to everyone who enters. If you have any questions, please see my policy page or feel free to email me with any questions. Again a HUGE thank you to Wayne for his time, story and to Scourcebooks for the donation. Check out Jessica's Haunted Halloween post with Amy Brecount White!! What a fun interview. Sounds like I need to pick me up a new book! This book sounds really interesting. I haven't read to many humorous books but I have read a few and loved them. I think I will really like this one because its also paranormal. That ending fooled me. I seriously thought something bad was about to happen. Emma and the Vampires sounds interesting, so I I'll pick it up from the libraray. Loved the story! I was expecting it to have some sort of creepy supernatural ending, but I liked the twist! Thanks for sharing! I'm not eligible to enter but I just wanted to say that this was a great interview!!! OMG! I totally love October :) Awesome giveaway! I'd love to read this one! I am so interested in the classics-gone-scary that are so prevalent in today's lit culture. Thanks for the contest! I'm loving the Haunted Halloween Comment Contest! Awesome posts, awesome prizes, and awesome blog hosts! I've been wanting to read this book so very bad. Emma is my favorite Jane Austen book of all. The cover is so creepy! It sure got my attention! Awesome story, I'd be the one saying don't go in and wondering why I was there at the same time. fun interview!!!! am I doing the comment contest right???? What a fun ending to a creepy story! Emma and the Vampires sounds like a terrific book! Ah well, order doesn't matter, right??? lol. I don't think anyone was ever so happy to see a spider web. Absolutely love the cover of this book! Cracks me up! I hadn't heard of this book before but it looks funny. I love all the new Jane Austen parody books that are suddenly coming out! This book looks great, love humor. Ooh, creepy story, yet totally possible. The best scary stories are the ones that could actually happen to people and Josephson shows that here. This sounds like such a great book! I really need to get it! WOW funny yet creepy story. Shows how sometimes an overactive imagination can creep you out. Emma is my favorite Austen novel (after P&P, of course). Mash-ups are so fun! This one looks like a good read.